As with many of life’s great success stories, an accident invents a new method or product. In addition a lie generates huge amounts of wealth for the inventor. It was no different for Will Keith Kellogg (WK). As a young man, WK started out as a door to door broom salesman. This would later serve him well in marketing and advertising the Kellogg Company. At the request of his brother, WK worked as the business manager in an upscale sanitarium. His brother (John) was the lead doctor on staff. John was an advocate of a better diet for the patients. He prescribed a lighter breakfast fare including whole grains. Naturally whole grain foods are not that tasty. To help the patients have better tasting food, both John and WK experimented in the kitchen. The brothers had boiled wheat. Due to an emergency, both brothers abruptly left the kitchen. They had left the wheat dough out and it went stale. As with most small business operations, the budget was strict and the two could not waste the dough. They had no choice but to run the dough through the rollers in hopes of getting sheets of dough and instead individual flakes came out – history by accident. The flakes were then toasted and well received by the patients. This accident occurred on August 8, 1894. By the end of April 1896, the brothers had patented the process. However, it was already too late. One of the patients there was a man by the name of C.W. Post. He witnessed the process and he started his own company, Post Cereals. As the patients at the Sanitarium left to resume their normal lives, they began to request the cereal be packaged and delivered via mail. To comply with the demand, John formed the Sanitas Nut Food Company. WK was the manager. Because the demand for the flakes had grown to such a high volume, WK opened his first company, Battle Creek Toasted Corn Flake Company. He hired 44 employees and together they created Kellogg’s Corn Flakes. Against John’s wishes, WK added sugar to his flakes in order to appeal to the mass market of consumers. In addition, WK began to advertise to increase sales. He decided to mislead the public. Paying $4,000 to the Ladies Home Journal, WK took out the first ever full page ad in a magazine. This was May of 1906. He informed the public that corn flakes were sold out and the earliest that orders could be received would be July. The company had just started in February of 1906. Prior to the advertisement WK’s production was a mere 33 cases per day. After the advertisement, production went to 2900 cases per day. Within a few years, production exceeded 1 million cases per day. He used other campaigns to increase sales including a free gift if you purchased two or more boxes. He created a wholesome image of the company by using country girls in advertisements. He was the first to use a billboard to advertise (Times Square, New York City). By 1911, WK was spending over $1 million per year in advertising. In 1922, WK changed the name of the company to Kellogg Company. Other products were developed including All-Bran and Rice Krispies. 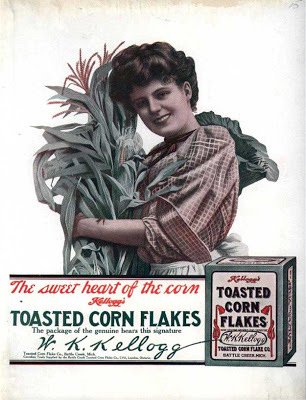 To meet demand, Kellogg opened plants in Canada, Australia and England. By 1930, WK had amassed immense wealth. Over his lifetime, he donated $66 million to a foundation he created – The Kellogg Foundation. This foundation works to improve the quality of life for children worldwide. The Kellogg Foundation controls over 22% of the Kellogg Company stock. The Kellogg Company went public in 1952. Many of our history’s notable individual’s wealth exist due to experimental accidents. W. K. Kellogg was no different. The unfortunate staling of wheat dough led to the creation of flakes. After being toasted, cereal was born. By misleading the public in an advertisement, WK grew his company many times over in a short period of time. A new success story was born. Act on Knowledge.